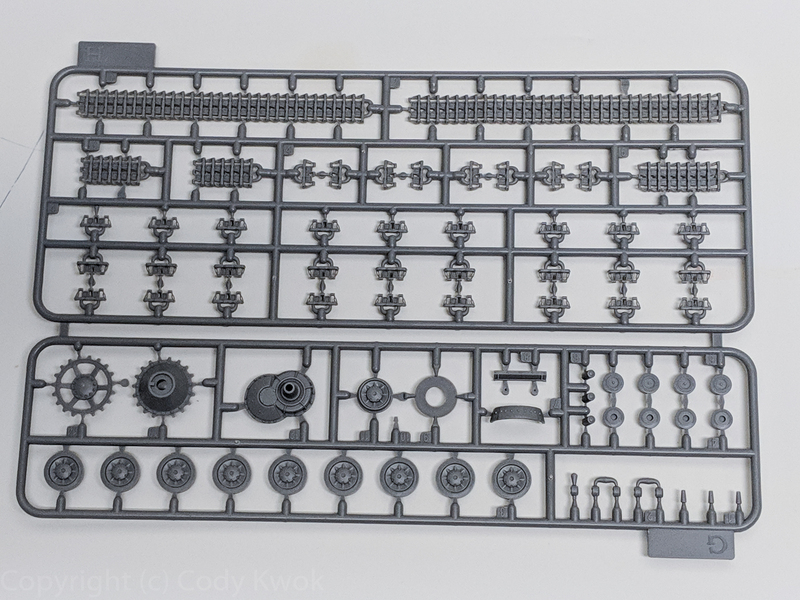 One of the more anticipated armor kits in recent years, the first model by Border Models is the venerable Panzer IV Ausf. G. As I have previously reviewed. The Panzer IV medium tank was the workhorse AFV of the Wehrmacht and produced throughout the war, with over 8500 built, second only to the Stug III. With its long service history it had seen many upgrades and variants, with extra armor, up gunning as well as simplifications to ease production. This kit’s own history is probably as interesting. 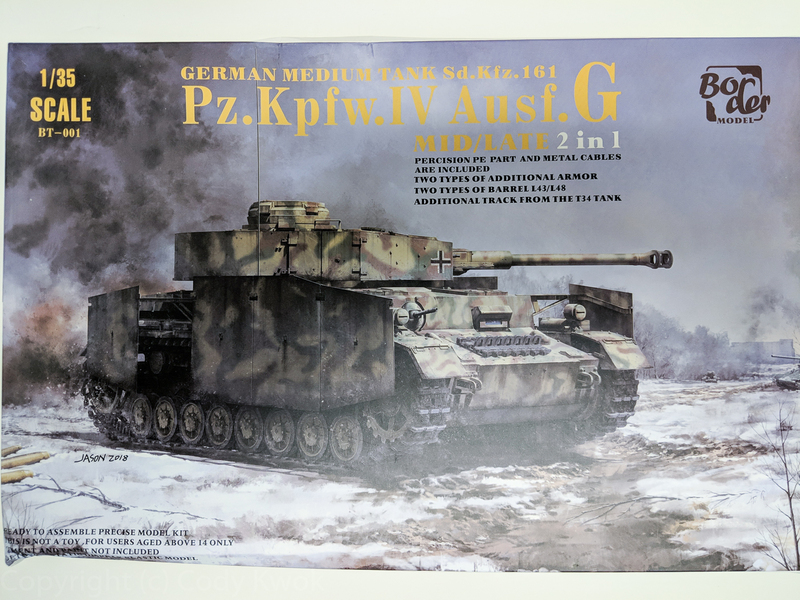 Initially the box art was revealed/leaked somewhere online and rumors had it that Takom was doing a Panzer IV. Presumably due to the art? Later the rumor was quickly disputed, but soon it surfaced that Border Models is the real company behind the scenes. Since no one heard of Border Models on the statesides, there were some suspicions that this is all a scam. In truth Border Models is a manufacturer of auxiliary modeling supplies in China, products include masks and various tools. A more interesting bit is that apparently Takom is strongly associated with the kit. 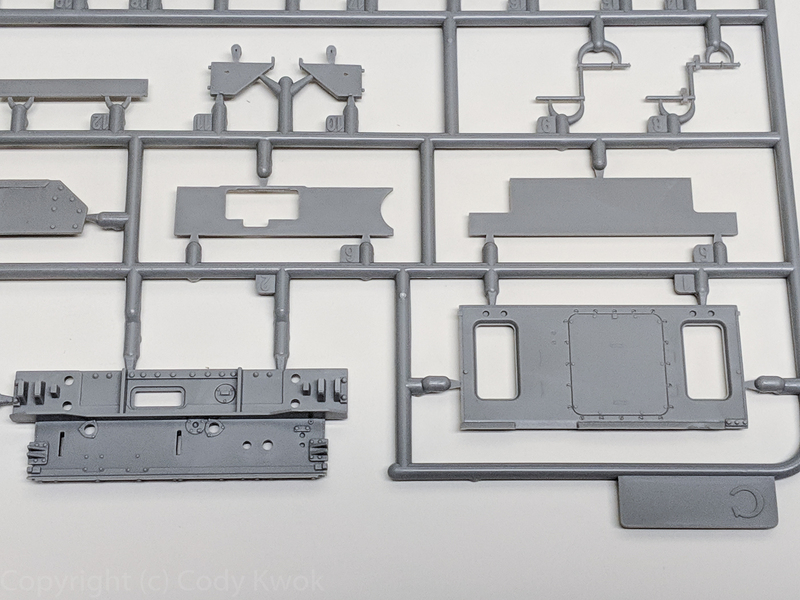 I don’t want to speculate their relationship, but the designers and factory producing the kits are the probably the same, as the kit has a very distinct Takom style to them as you can see. This also goes for the Das Werk brand. Not sure what’s with the branding issue but you can see why this kit has generated so much confusions. An additional marketing stunt the company did was to call out Dragon. In fact it’s all very juvenille, with Border calling their kit a Dragonslayer, and if they aren’t better they’re going to eat crap. It’s quite true that the kit is trying to be a direct competition of Dragon, who is the reigning manufacturer of perhaps 30+ or more Panzer IV variants, as you get this feeling that you’re building a “smart Smart Kit” in essence. Let’s see how this kit fare. The first production run of the kit includes two bonus goodies. A commeroative blade holder and a random masking sheet out of 7 designs. The first production run also includes a metal barrel (in black) and metal smoke discharger. The latter I personally like very much as I often replace the kit ones with metal. 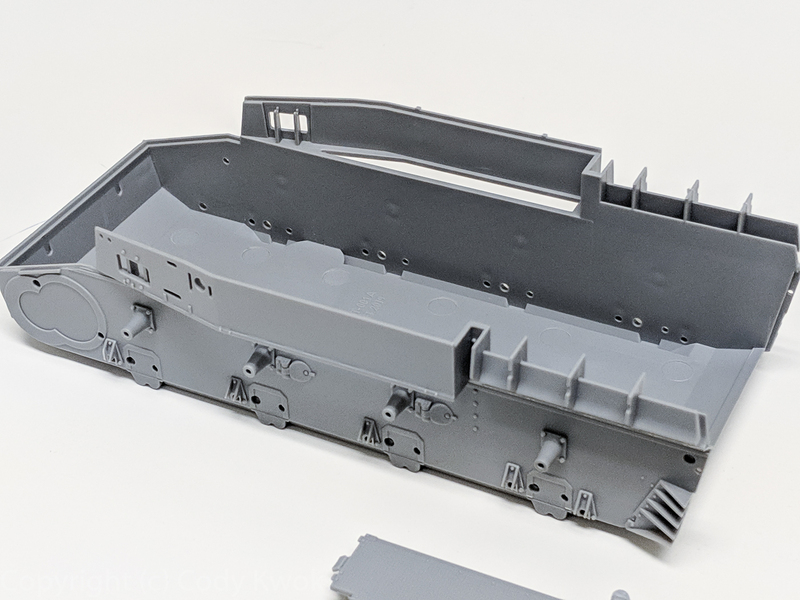 Like many Takom kits it has limited PEs, and in fact most of them are the engine exhaust cover that are not used if you choose not to close them. Then there are the same Dragon’s glacis plate track bracket, and a small sheet with tool clamps. Yes the maddening 3-piece tool clamps. 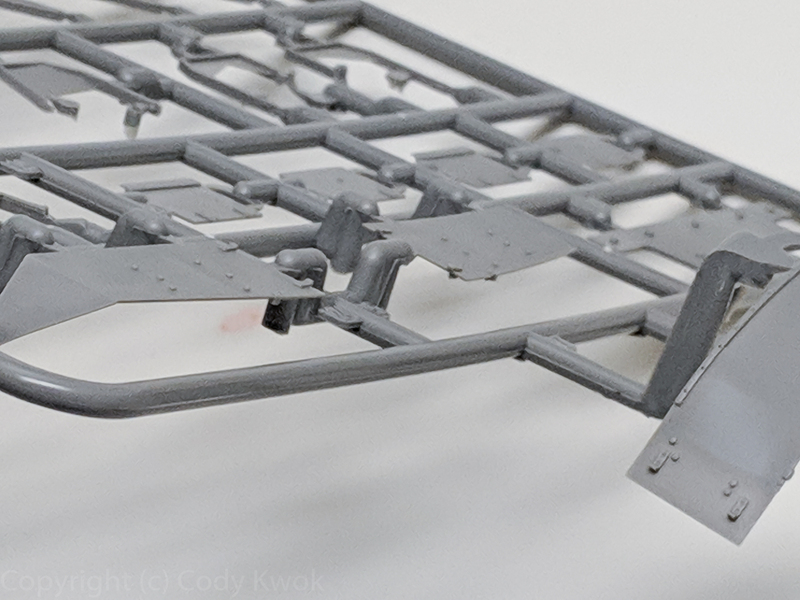 You don’t have to do them as you have styrene equivalent, but read on. 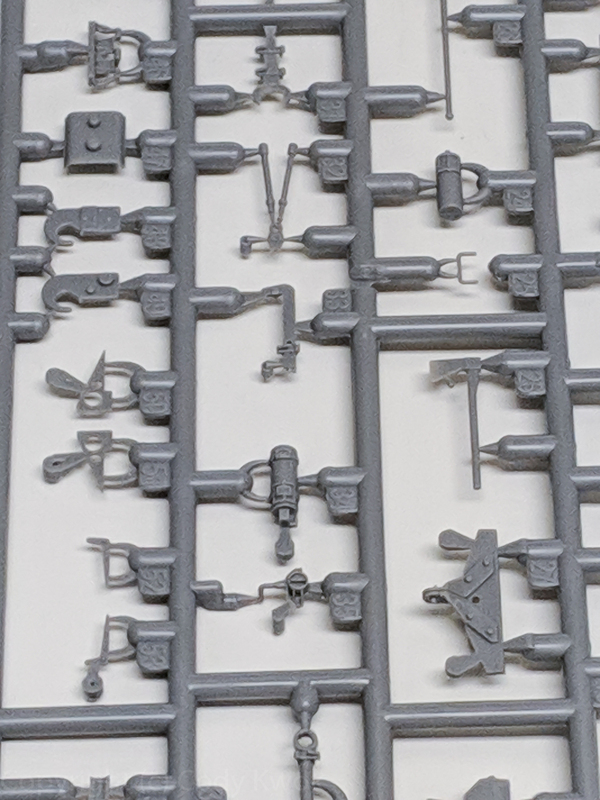 Running gear sprue F. The kit has no A and B sprues. Fine Continental engraved on the tires. 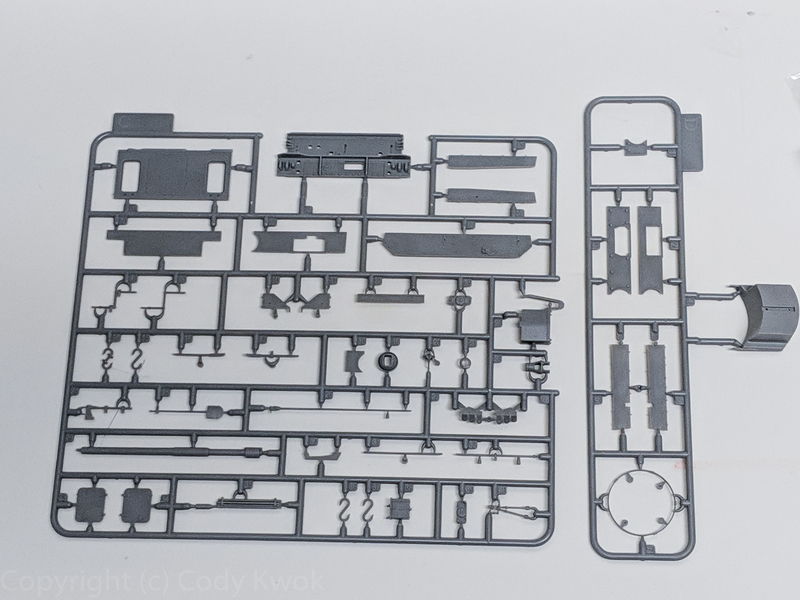 Sprue G of more running gear and the link-and-length track. The tracks are sagged and looks great. In Dragon this armor is in 3 pieces, and this kit put them all in one. 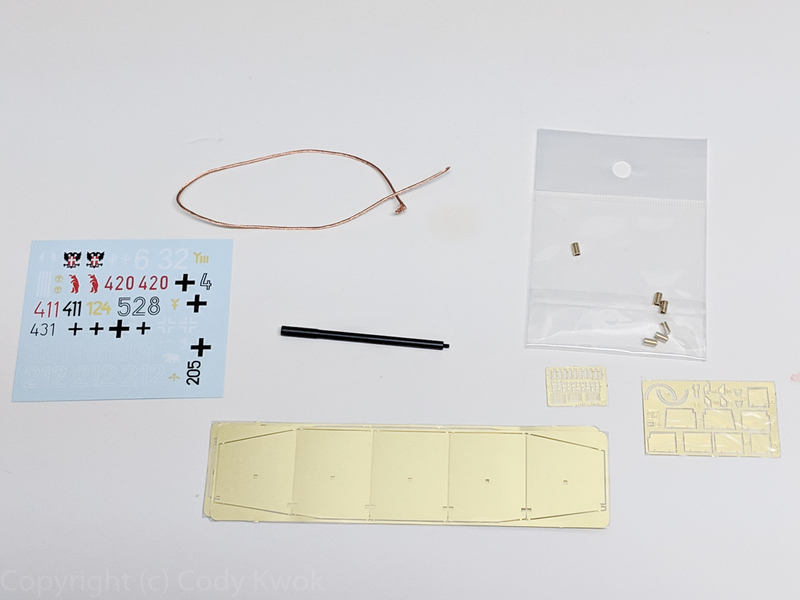 You start getting this “smart Smart Kit” paradigm with Border putting many subassemblies together for ease of assembly and fit. The tracks are *really* good and are virtually identical to magic tracks put together. There are shallow injection pin marks every 8 links or so, not difficult to handle. 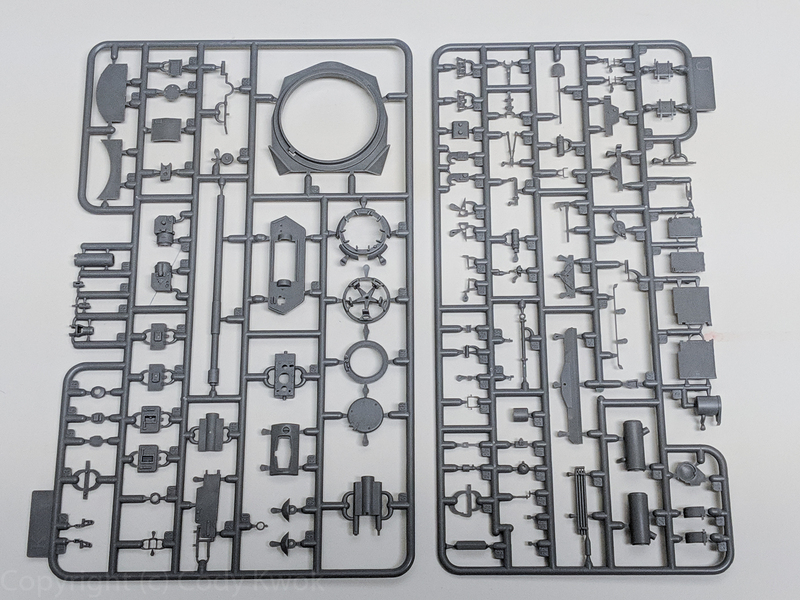 Sprue D and E with OVMs and various plates. Jack block, very finely engraved wood patterns and looks better than Dragon’s, where the side strips often was flush to the edge losing some details. Stowage box. 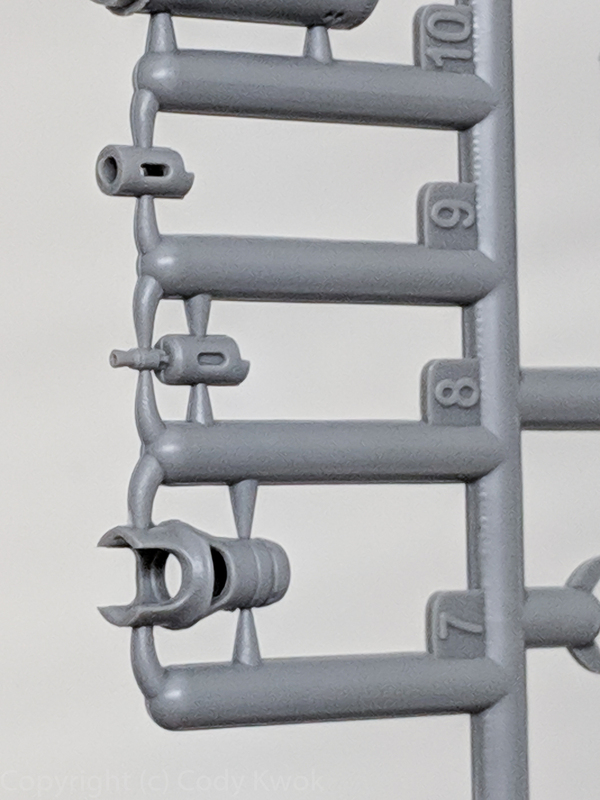 In Dragon the side arms are separate, which means you have a bit of wriggle room and you need to work on making sure it sits level with the turret. Here it is molded on and saves you that trouble. Close up of various armor plates. I would say they are at the same level of Dragon’s. The smoke discharger mount has a large depression in the middle for fit. In Dragon’s you have a much smaller guide and it was more work to fit. The aerial is not as fine as Dragon’s but it’s a very minor difference. I don’t think either are in-scale and either require replacement or sanding. OVMs. The kit offers you both molded on clamps and also the option to use PE. Closer look. The tool-clamps shapes are more accurate than Dragon’s but they require you to hollow out the middle. 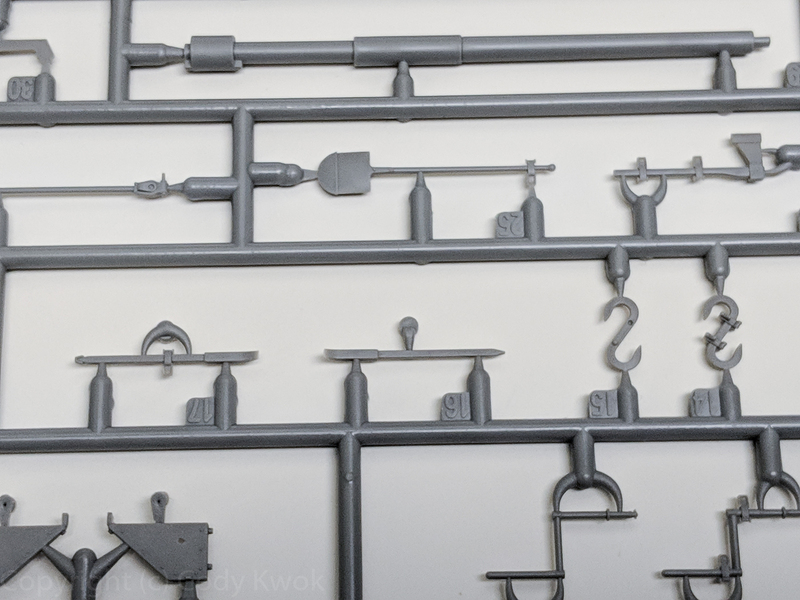 If you manage to do that the clamp would perhaps be the best-looking clamp styrene can offer, but this is some work, and some people may not like it. I personally don’t understand why they don’t just do PE handles like HobbyBoss does. Here you get the full PE clamp, they are typically test of will. Set of OVMs without clamps. 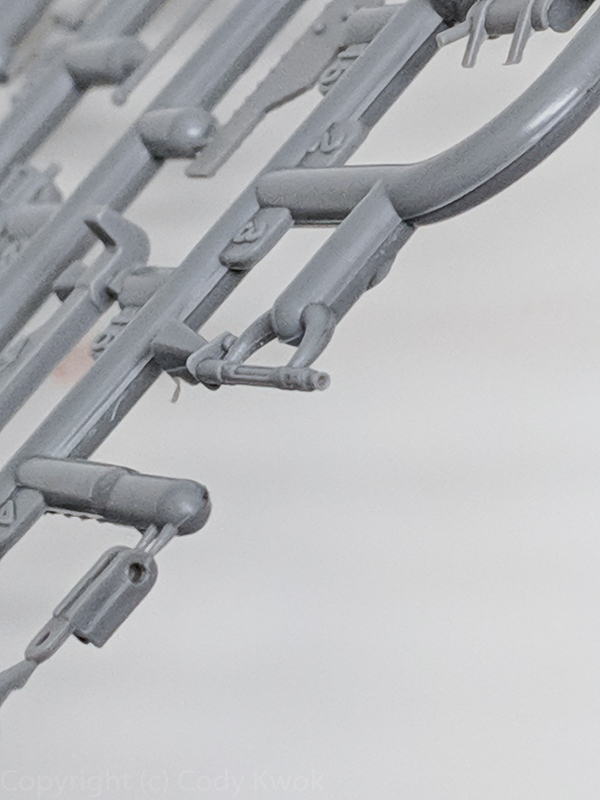 I am very impressed by the machine gun muzzles, has to be the best one I’ve worked with and probably very close to metal barrels, say from RB’s. These fender supports are thinner than Dragon’s, but thicker than PE. I typically just sand them down. Unlike Dragon the main part of the muffler are cast in two halves and is the only part that requires seam handling. On the plus side the muffer’s exhaust opening is very thin, unlike Dragon’s which has much thicker walls that I needed to thin. The turret MG and once again impresses with its muzzle wall thinness. 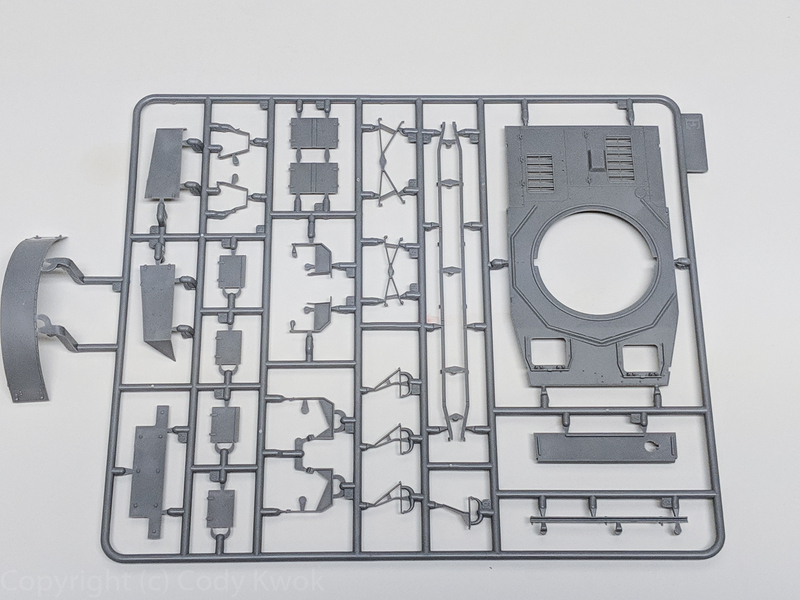 Sprue C of applique armor and top of superstructure plus engine deck. Once again Border molded these all into one piece. 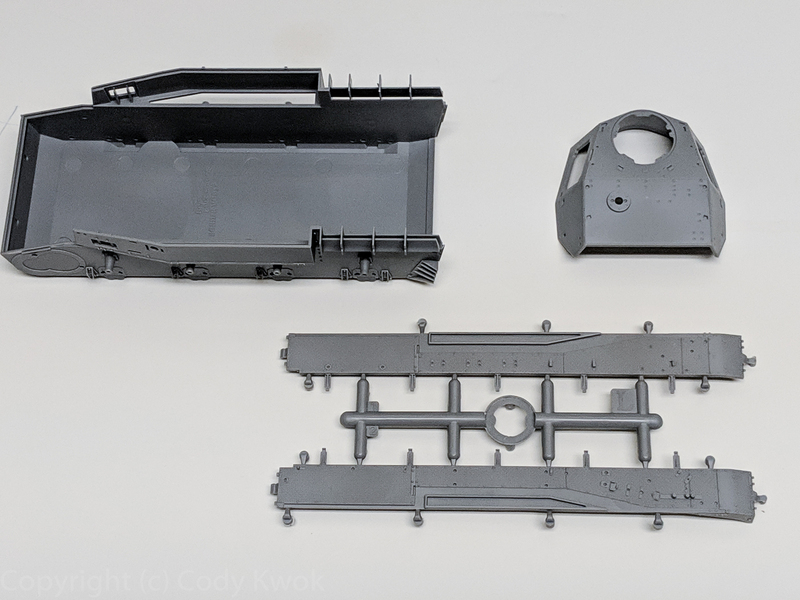 As mentioned in my Dragon review these engine doors were very tight in Dragon’s and some may struggle to get a perfect fit, so Border addressed that here. Of course you cannot open it as a result. The armor plates are very thin, probably a little bit thinner than Dragon’s, since Dragon uses beveling (what they call Razor Edge) to get thin edges and these pieces are very thin in general. The hull tubm fenders and turret. The hull has to be the highlight of the kit. I have never seen anything like this, with the lower hull almost completely molded, and part of the superstructure as well on the sides. These were the tricky spots in Dragon’s build and Border really targetted them. The suspension springs are moulded in place. Even the front is molded in place. 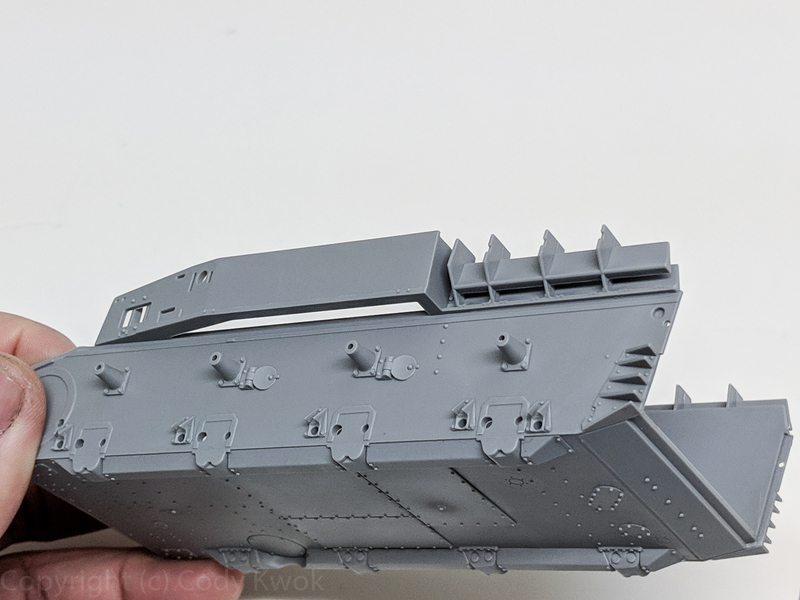 I mentioned the lower hull front was tricky to fit for Dragon and here you get a one-piece. The stowage bin cover with some internal details, but big ejection marks. You probably want to close them. Turret side hatches. Identical to Dragon’s, though I wish someone would finally make the right handles. The front mudguard portion of the side fenders. This is another tricky assembly with Dragon and Border molded this in one piece. I like it a lot. Smoke discharger in styrene. The wall thickness is similar to Dragon’s, and of course I’ll be using the metal parts. The return rollers on the left are easier to assemble than Dragon’s, with better contact between surfaces. Just don’t put the peg in the hole there, which I did, cos that’s not right even though they fit perfectly. Assembly begins, and as usual I assemble the main vehicle first before adding details. There is only one place you need drilling and that is the front lower hull to receive extra armor. I didn’t do that, but you don’t really need alignment pins there. The side fenders fit like a glove and there is only one way to make it happen, so very idiot-proof. Dragon kits’s side fenders are more tricky to get right as you need to manage the horizontal alignment and also care about aligning the rear. Now if I were more patient I would have done the running gears and tracks first so that I could have an easier time doing the tracks, but hindsight is 20/20. Before we get ahead of ourselves however let’s talk about step 1. First they’re missing the part numbers for the covers, G6 and G5. The exhaust bay can be covered or open. I don’t think Dragon gives you that option aside from their Tauchpanzers. 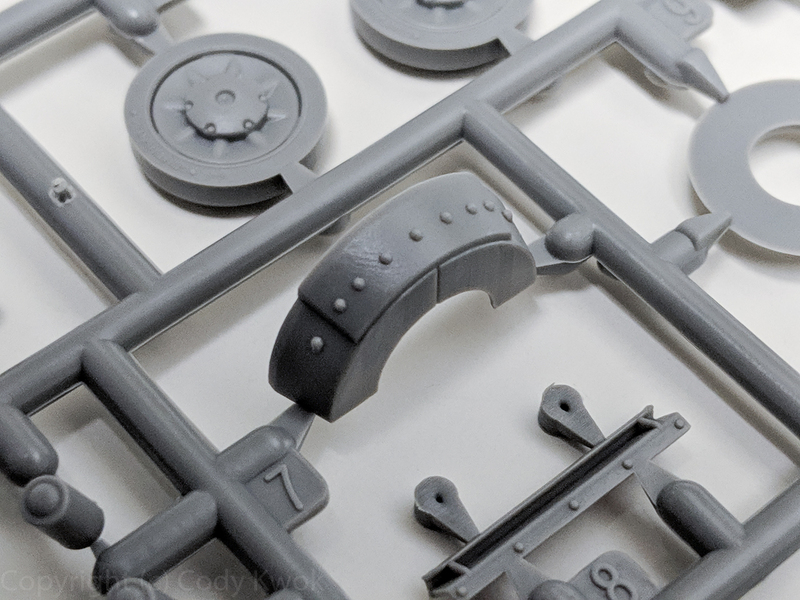 If you choose closed you use the PE pieces, otherwise you use the styrene. Step 1 asks you to do this stunt of attaching covers to the hull first. Even if you succeed, this will get knocked off all the time. You could also attach the fenders first and add this later. I chose to do this attachment first and slap on the fenders right afterwards. The cover locks are very well-molded. I glued them to the fender to make sure they stay put. On Dragon they are sometimes molded in an undetailed nook or you have to add them yourself. You need to cut off the two pins under the ports on each side. The rear plate fits, really, really well. This is always a bit of work on Dragon kits. The top also fit well. 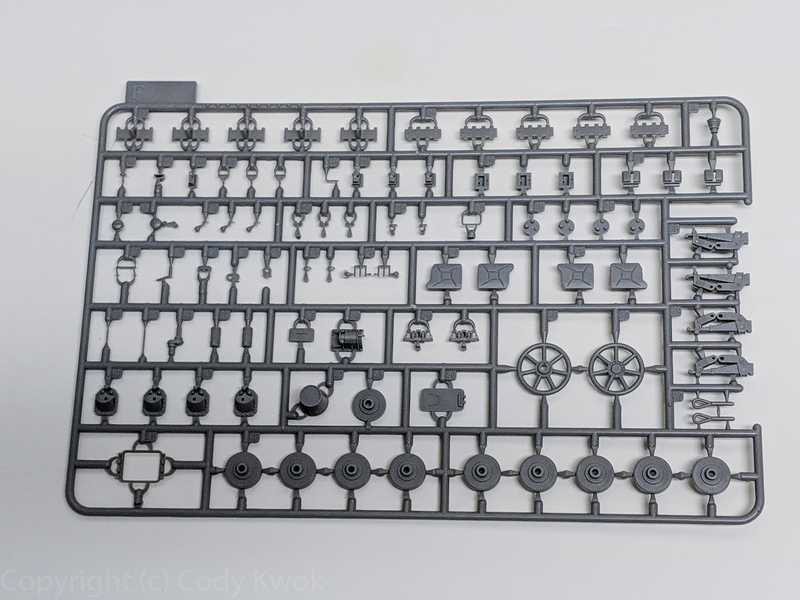 This assembly is different from Dragon’s where they have the engine deck’s side panels attahed to the top. Border has a one-piece top. First make sure you fit the top on, it’s very tight and like Dragon kits the hull is slightly warped to create useful tension when you fit parts. Slowly run some quick setting glue along the welds. You’ll get perfect fit at the end. Muffler with the only seam line you need to process. These never bother me too much and the correct thickness for the exhaust is a bonus. The lift hooks are another improvement over Dragon’s, they look sharper and are shaped better. As a plus, their gates can be used to handle the piece for gluing, detach after the glue dries and sand. At this point I have to work on the tracks, which means I have to do the whole running gear. The suspension is a slight simplification over Dragon’s, saving one, but otherwise very similar. Curiously the arms are quite a tight fit. Another very interesting small pin mark in the center of the wheel you want to sand off. In Dragon the cap is a separate piece but it really makes no difference. in the level of details. 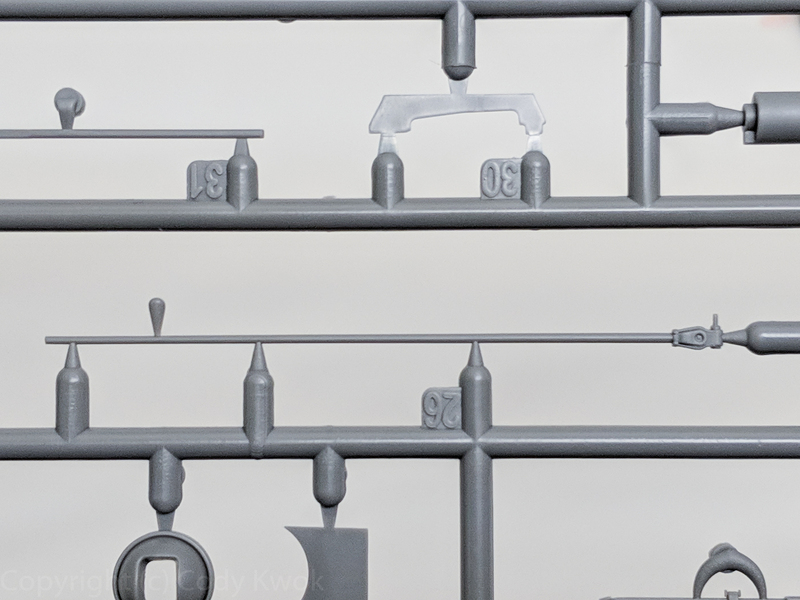 One difference with Dragon’s casting is that just like Meng, the kit has some of these long ejector pins stuck out. If you don’t spot it when you inspect the kit you may find that the piece doesn’t fit. I screwed up my assembly of the superstructure top since it had two pillars I didn’t take care of, causing some amount of damage when I pryed the top open again to remove them. Here the front drive has another and after 30 seconds I figured out this was in the way. Dragon kits don’t have this type of pins. Here I sandwiched the return rollers for quick assembly. The regular wheels whoever don’t align and I couldn’t do this. We now deal with the track. The upper section is sagged apprpriately. I used quick setting glue to get the two curves on each end. There is a very difficult to see diagram that indicates the number of links on the idler wheel, which I counted 9. The kit instruction is good but still have quite a bit of omissions, like it wouldn’t kill them to say 9 links here would it? Also the english coverage is rather spotty as you saw in some of my instruction shots, but you sort of figure out what they’re saying. Before the glue is completely set I draped it over the wheels to make sure they fit. They are perfect. Strangely however the suspension arms has a bit of play in it and the wheels may not be completely level, so when you assemble them you want to make sure they are. 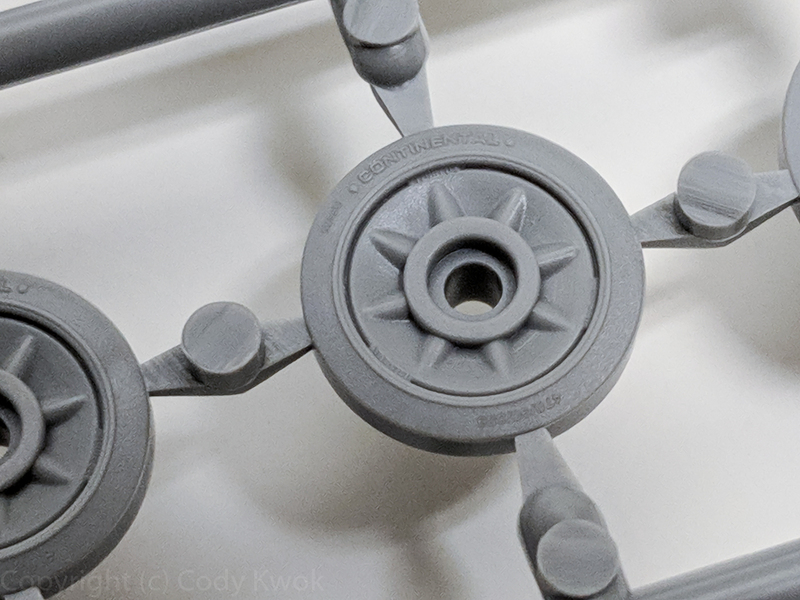 It is worth mentioning that the wheel clean up are much easier than Dragon, because each wheel has 3-4 gates and you just need to take care of those, whereas Dragon has mold lines across the whole wheel and it wasn’t the most pleasant to deal with. Also the hub cap of each drive wheel are molded one piece. Here I think you do lose a little bit of detail, but in Dragon kits that cap assembly was very tedious so I think this is a good trade off, particular when you cover the wheels with weathering. The finished tracks. The wheels don’t completely touch the track due to the play I mentioned, but they are easy to fix by eventually gluing the wheels to the track. Indeed having the side fenders complicate the track fitting, so I regretted my own order of assembly a bit. The idler axle is the strangest part of the kit as it’s quite loose because you don’t have a fitting peg-in-hole mechanism here to hold it. When you shove F31 way in it seems to fit like it does here, but you have to glue it solid. Because of link-and-length nature of the kit the axle is fixed and therefore you can’t adjust track tension using it. I decided to start working on the painful tool clamps at this point as I need them to mount OVMs. It turns out the PE fret is supplied by Voyager. Random unrelated tidbits… Voyager offers two types of tool clamps, the “2nd gen” offers long “arms” for threading the top and bottom of the clamp through the handle. The advantage in theory is that once it goes in it doesn’t come out as easy, and one of the trickiest aspect of the tool clamp assembly is to make sure when the top part of the clamp is fitted into the handle slots, you don’t let it come out when you force your clamp bottom into the next two holes, and the longer arms do that. Anyway these are not those. I’ve seen the famous Youtube video on how to do these for Aber clamps, didn’t work well for me so I did it the following way: first you really need good pair of tweezers since these are so tiny. Then I folded everything as instructed (use a metal roller to curve the clamp top), and dab the top of the clamp (which goes in first) in a little CA gel, and fit it into the handle. The gel gives it a little staying power without permanently affixing the piece. Then as shown in the photo I clamped down the bottom in my PE folder and using a good pair of tweezers to hold the handle assembly, thread the arms of bottom clamp through the two eyes of the handle. The CA gel prevents the clamp top from falling out in the process. After threading is successful I use my tweezers to squeeze the tip of the handle a bit to lock the assembly. They take about 10 mins each which isn’t too bad. Just for kicks I made a half-hearted effort to hollow out the styrene clamps to see how they look. 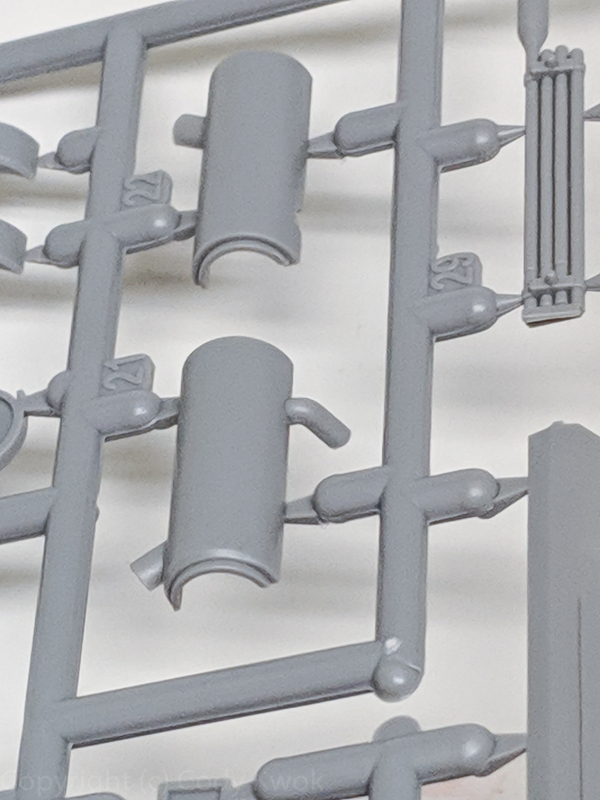 With some microfiles or sanders they’ll look not only in-scale but also correct in shape, better than most styrene clamps on the market. The other option as I mentioned is to clip out all the handles and replace them with the handles from the PE set. 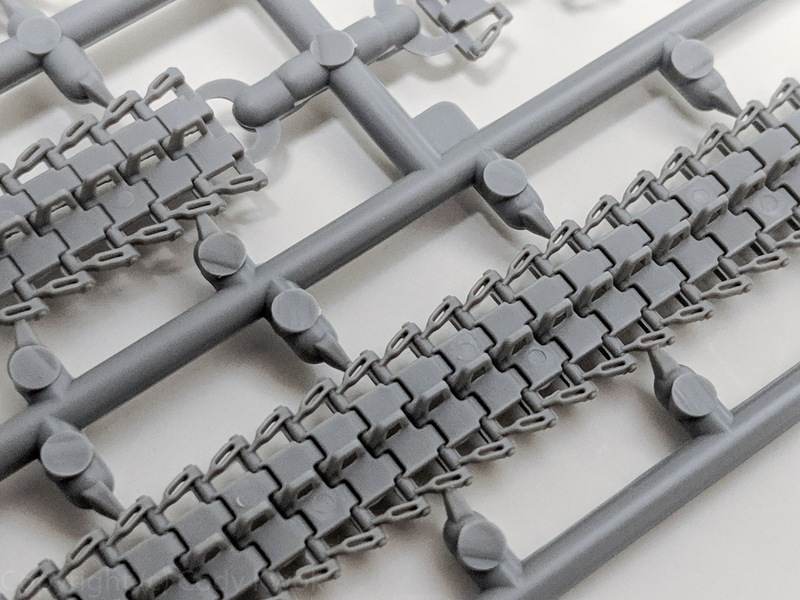 This is a very good option and I did that all the time for Dragon builds, and reserve the intricate full PE clamps for more serious endeavours. This is perhaps optional given these suspension nuts are not normally visible, but using a good nipper made short work of these. 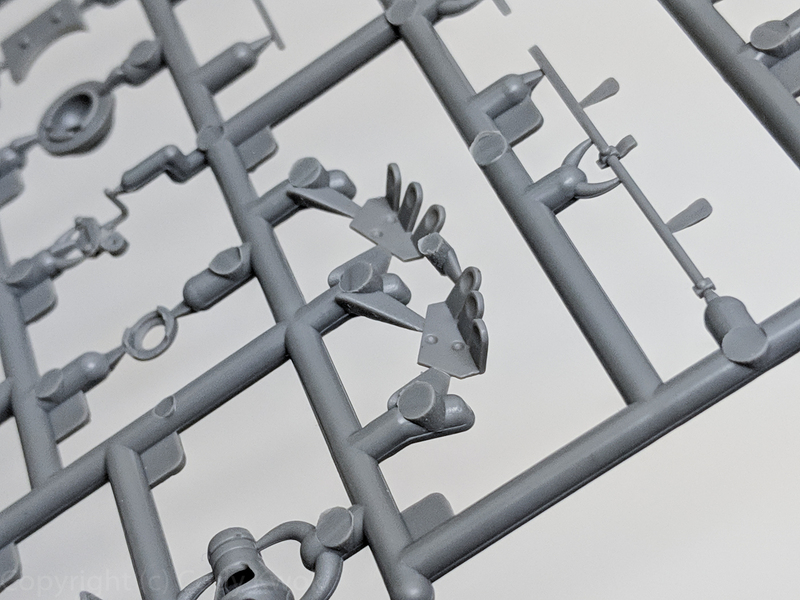 These nuts appear along sprue F and there are spares in case you lose some. These muffler support is more detailed than Dragon’s, but it’s a bit difficult to mount them because they don’t have clear attachment points. Dragon have you attach them to the muffler’s ducts. The jack brackets are finer than Dragon’s. This is where it seems the plastic is a bit weaker than Dragon’s. The pieces are finer and thinner which must have contributed to my problem, but one of the brack broke in the middle of the “S” while I was sanding it. And you need to sand these because there are seam lines running in the middle of these. I’m very happy with their Bosch light mount, which includes the cable. Dragon often don’t have these and I had to add them. The lights are also futting in this slot a lot more flush than Dragon, when the latter were often wriggly after assembly. But the disadvantage of Broder is that the Bosch light’s slit has a larger degree of freedom than Dragon’s, and you need to make sure they are level before glue is set. I made that mistake and was difficult to correct. Now most of the OVM are on. Something a little dumb in their kit design: they include a separate set of tools with no on-vehcile brackets or clamps. 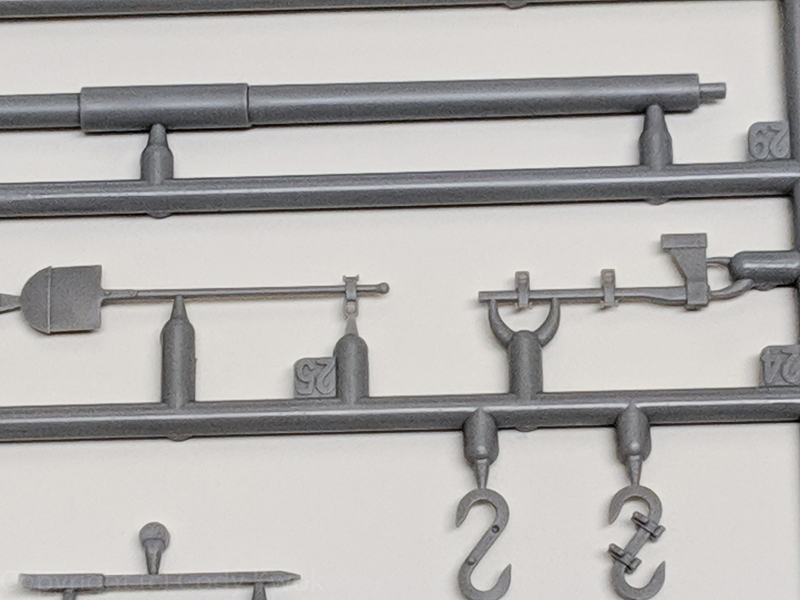 HOWEVER, a few of these such as the shovel and crow bars have brackets in addition to the clamps, and there are no PE or styrene parts associated with these brackets. 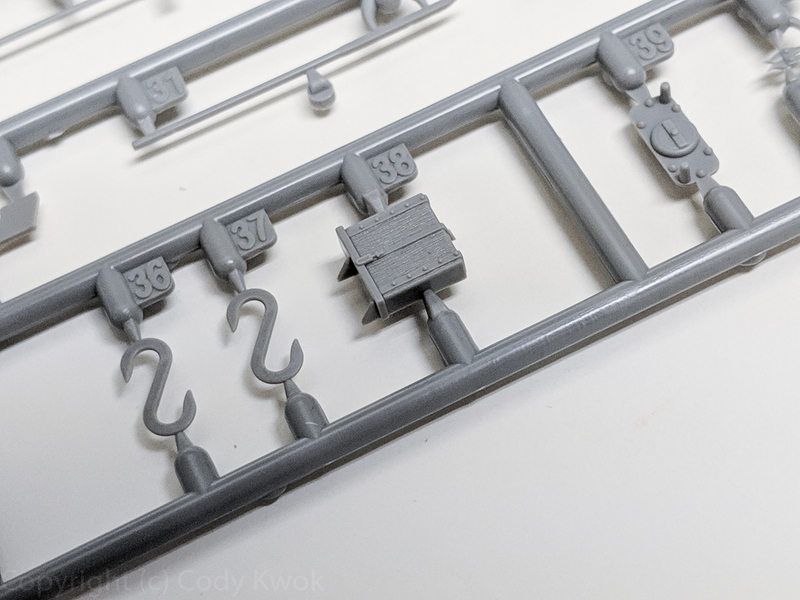 As a result, if you don’t scratch build or use additional PE sets, you cannot use the PE tool clamps with this of tools, which means you have to clip off and sand off the styrene clamps from the molded tools. What the heck? The rear plate with mudguards on. As I mentioned earlier due to the better fit of the side fenders, the mudguards went on smoothly compared with Dragon which was more of a struggle. I decided to attach the muffer support here first for ease of painting. The spare wheel bracket is a 3-piece affair compared with Dragon’s one piece. I installed the sides first onto the vehcile before the front, but in restrospect it might be easier to assemble the bracket first. I did not install the 4-piece barrel cleaning rod that was supposed to be mounted at the back. There are two choices there and I haven’t decided on my vehcile configuration yet. Because I lost one piece of F30 which is the rear mudguard spring, I used a spare from Dragon. Which makes me realize one of the inaccuracies of Border. This kit has the spring with two “cylindrical” ends, so you attach these ends to the sides of the fender and mudguard. Dragon however has the mudguard end attached seemingly to the bottom of it. Checking my references I think Dragon has the right configuration. Onto the turret, which seems to have more issues than the hull. In Dragon build the F45 assembly is a 3-piece affair, having a recessed opening and two hinges, each hinge having the axle sticking out on top? You can see in my Achtung Panzer book as well as other references that the pins of Dragon is correct. Also the recessed opening of Dragon is correct whereas this “lip” style of Border didn’t look right, but if you close the hatches it wouldn’t matter. But the top stuck out pin is a bit disappointing. The lip-style opening. The other confusion is that the opening F35 *seems* to have different left and right sides, but the instructions didn’t say which,. Both hatches fit on both hinges. So I suppose everything goes here. Another error in the instructions, the part K35 was flipped and I thought I was going crazy. 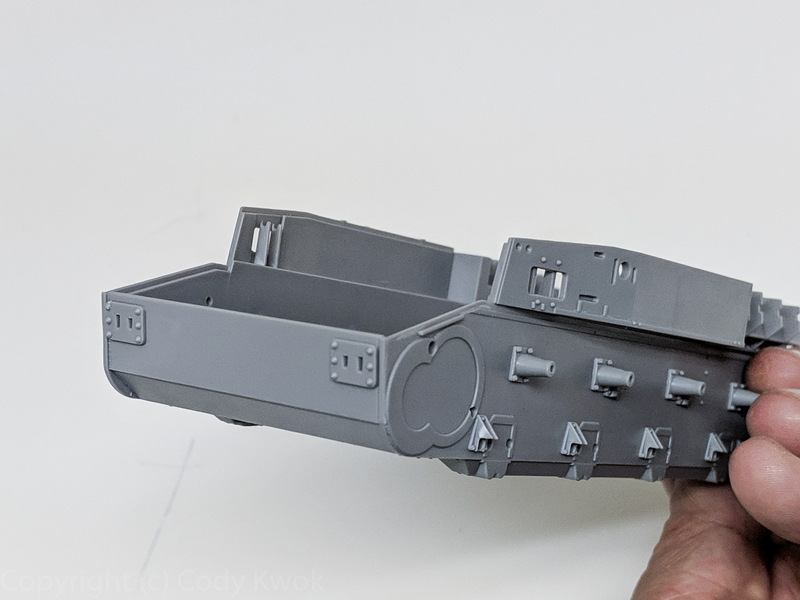 As with the Dragon kit I assembled the bottom turret first and then the mantlet afterwards, to ensure best fit. Here the fit of the mantlet is a bit suspect due to the amount fo wriggle room, so you want to make sure all sides are flush. 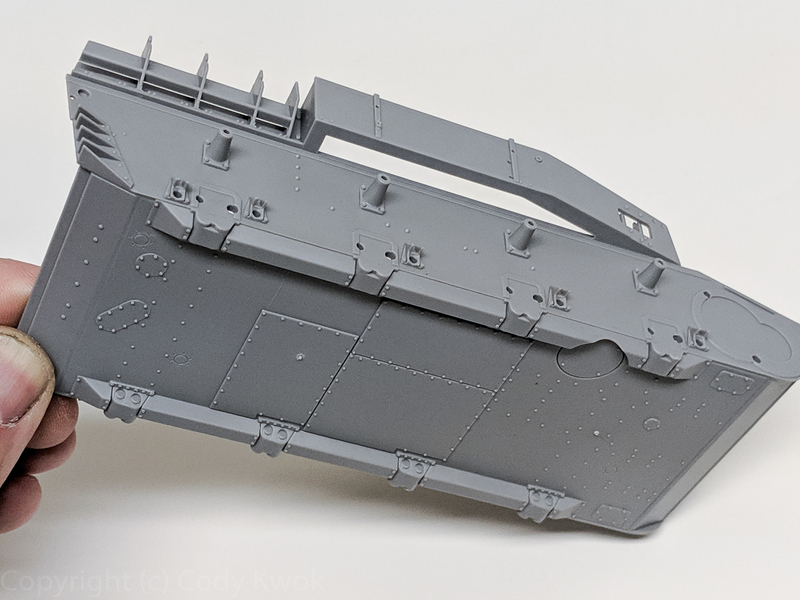 The hatchs and top of the turret has these inauspicious ejector pin marks that you need to sand smooth. This is perhaps the only serious fit problem with the kit. The hatch opening F35 and the doors don’t fit. I chose a buttoned up tank and so I glued the inner hatch first, and sanded down the outer until it could fit. Here I used the metal barrel, which is a replacement for the L48 gun and if you decided you want L43 you can only use the styrene. The metal barrel only has a portion of the styrene part so I wasn’t completely sure what’s going on. You shove the metal shaft into the fume extractor all the way, and separately put the barrel-less assembly. You need this piece to mount the mantlet. 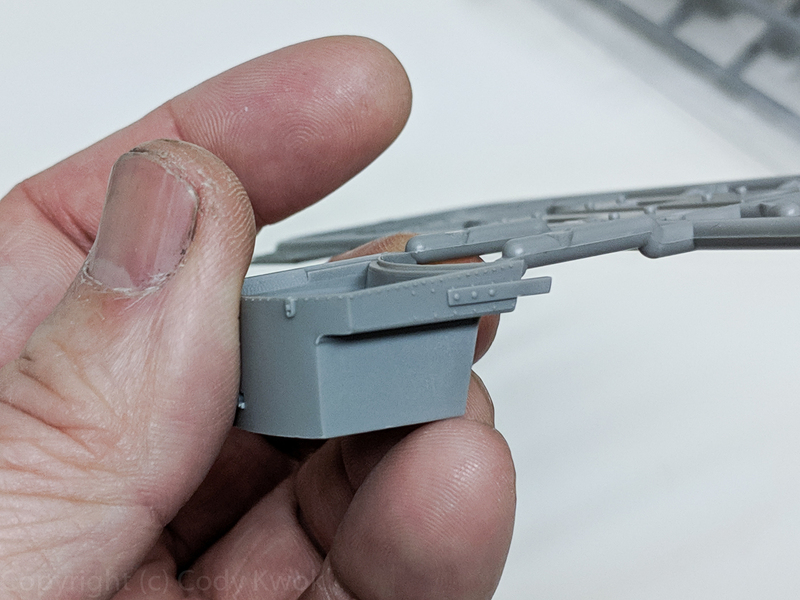 Of course you can saw off the styrene piece and connect the two in case you really want the gun breech. According to my Actung Panzer Ausf. G still has the two gun pods in the back, and Dragon has them. They were eliminated in Ausf. H. So I think this is another inaccurarcy in the Border kit. This is hard to see after the stowage box and applique armor is on, but if you really want them your Dragon spares will have plenty. 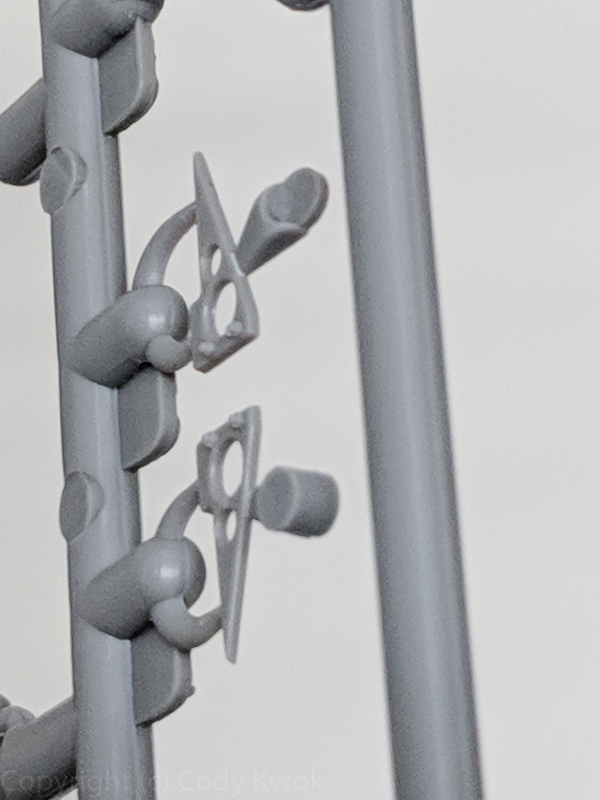 Another nicety of this kit is that the applique armor connect groove has a bump at the bottom of the groove. This significantly reduces the play of the brackets and gives you better alignment than Dragon’s. Test fitting the applique armor, and alsogot the smoke discharger on. The rims of the smoke dischragers are quite thick and I was a bit disappointed. I could’ve used the styrene and thinned them instead. I think other aftermarket dischargers have more in-scale walls. Here I’m comparing the voyager metal smoke discharger (left) with Border’s. The instruction asks you to glue 3 handles to the hatch, the location guides are very, very tiny but they are there. 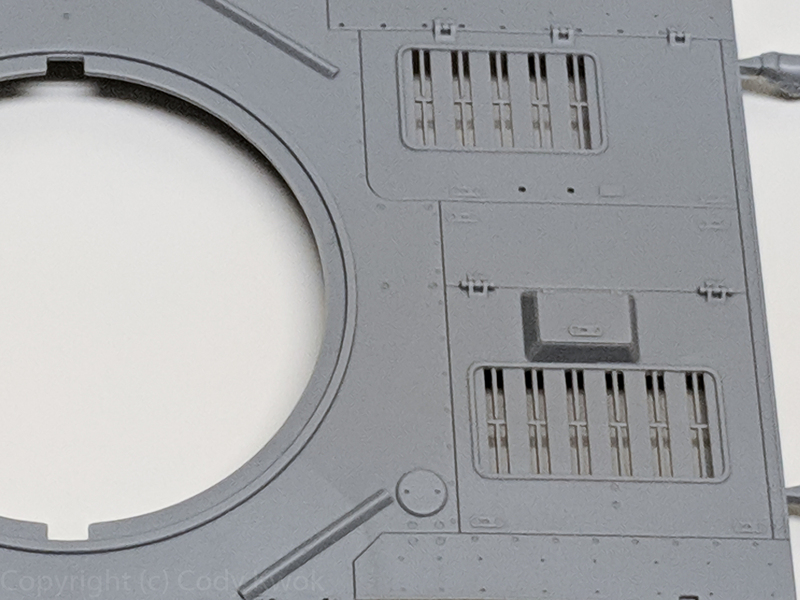 One of the issues with the kit is that they have ejector pin marks in some internal surfaces, such as the inside of the hatch. If you plan to close them it’s not a problem. Onto the applique armor. The backpiece is quite warped and not curved enough to stay in shape. I put it in place and use hairdryer heat to bend it. The inside of the armor also has 4 large ejector pin marks that you want to sand down. The brass Schurzen fits, but is a bit loose unlike Dragon’s.